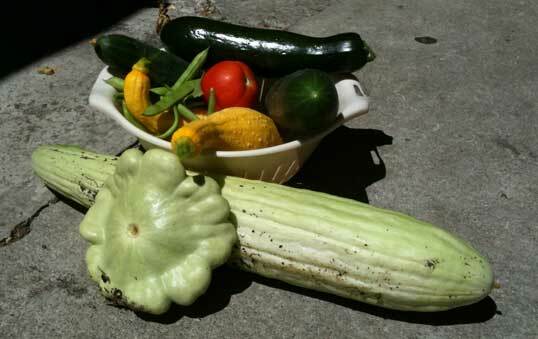 Atrios posted Sunday Rooftop Harvest Blogging so I figured I would post a Sunday Backyard Harvest Blogging post. I used to be a purist. 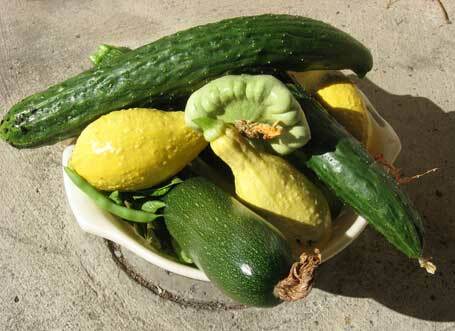 Everything in my garden was organic, grown from seed and was only a heritage variety. I guess I grew up to the fact that although this was the noble thing - it may not be the most practical. I am still a purist in terms of organic, but I'm afraid I have moved away from lofty ideals when it comes to which variety of vegetable to choose. This year I had to start completely from scratch due to moving house. My old garden was just reaching that point where it was old enough to thrive on hearty piles of self generated compost. Enter new patch of ground covered in weeds and no compost. I had no time to start anything from seed. It was either buy plants or miss the season altogether - so I bought plants. Among the plants I bought were a couple of hybrid Early Girl tomatoes. Right now, mid-July, these two plants are already giving us ripe tomatoes. A newer plant has fruits ripening up almost as fast as an older plant we moved from the previous garden. See below the older Early Girl already with red fruits. And the one month newer Early Girl also about to produce a juicy delicious ripe tomato. While I was spending all my energy making raised beds and adding soil amendments and not taking fun trips out of town, a good friend came back from a trip to an organic nursery and gave me a couple of heritage tomato plants. These I planted within a week of the newest Early Girl. The pictures speak for themselves. Here is the Kentucky Beafsteak. A nice healthy plant, many flowers, good foliage - one green tomato. And here is the one green tomato in case you missed it. And last but not least the Church tomato. One tiny little green tomato near the top of the plant. Can't see it? Took me a while! Maybe these heritage tomatoes are not suited to this particular Californian mini climate? Maybe they will suddenly come in to their own in September? The jury is still out, but right now I must admit that I am glad I lowered my standards, because I am enjoying lovely ripe home grown tomatoes. Yum! I will let you know later in the season what I have decided about Heritage vs Hybrid. They're eating food grown in the White House vegetable garden. Working with a few professional supervisors under the eye of their host, they pulled up a big bounty: 73 pounds of lettuce, 12 pounds of peas and one cucumber (which had originally been white but was yellow by the time the kids got to it). And then they all went inside to cook, before returning to the garden to eat.